Race enthusiast had great expectations for the Belgian Grand Prix, held on the stunning Spa-Francorchamps track. Unfortunately, Belgian customs officials demanded a heavy duty from the German Grand Prix teams for their alcohol-based racing fuel. The result was a withdrawal of both the Mercedes-Benz and the Auto Union teams from the race. This made for a very small grid of seven cars; three Bugatti T59s, two Alfa Romeo P3s, a Maserati 8CM and a Montier-Ford Special. Original art & limited editions available. Raymond Sommer was the only Maserati driver present, so that the real race was going to be between the Scuderia Ferrari Alfa Romeos and the Bugattis. 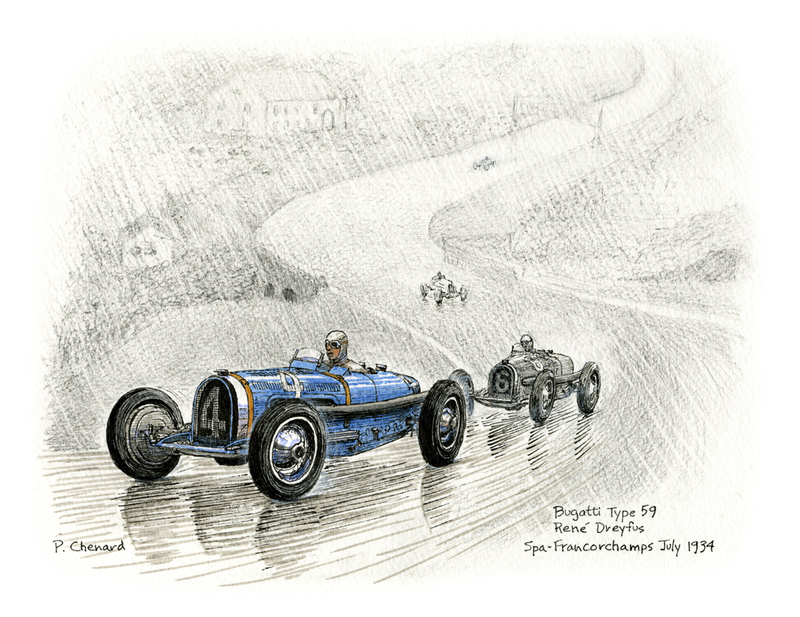 As the typically rainy race began, Louis Chiron took the lead in the Alfa Romeo, with the Bugattis pitting with fouled plugs. It looked very much like another Scuderia Ferrari win in the works. Unfortunately, Chiron’s racer slid off the track and overturned; he was luckily uninjured in the incident. Achille Varzi took comfortably over his teammate’s lead, and at the same time, the track record. This was not to last, with his smoking Alfa Romeo coming in with a blown engine. With their only real opposition out of the way, the Bugattis of René Dreyfus and Antonio Brivio cruised in first and second, with Sommer a distant third for Maserati. It was to be one of the very rare top-level wins for Bugatti in 1934. Another fabulous drawing Paul, I can feel the chill of the Arden as I write ! Belgium has a long history of 3 levels of government, so 3 times the red tape!